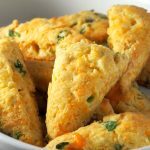 Cheesy and buttery with a good savory flavor, these Cheese Scones with Scallions are a nice treat for your breakfast or as a side dish to your meal. What makes me more and more in love with baking is the fact that the possibilities in it are endless. One day cakes, next day bread. This week, labor on croissants. Next week, relax on muffins. It is like I can bake my whole life and there are still options left to tackle. One day, bake scones. 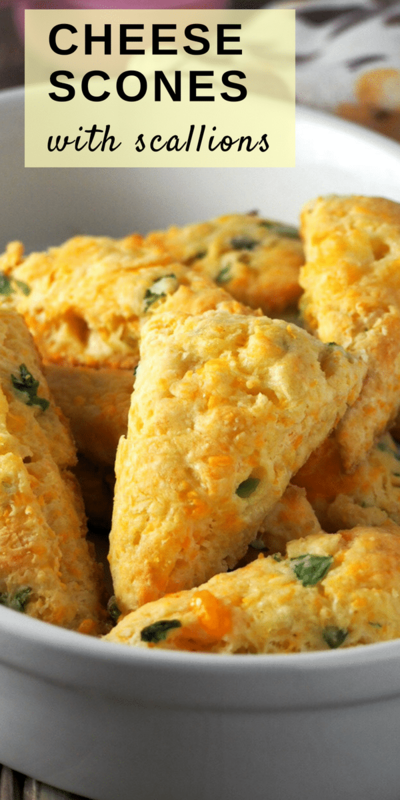 And even with scones, you still have choices: savory or sweet. Today, I choose savory. 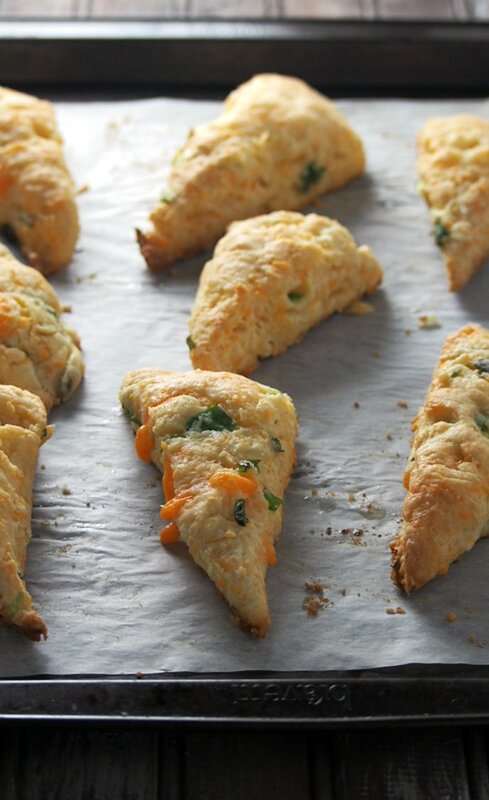 These cheese scones are vibrant with the addition of cheddar cheese and have a nice savory flavor from the scallions. Crisp on the outside and soft pillow tender inside, these are wonderful to munch on alongside a meal or on their own. 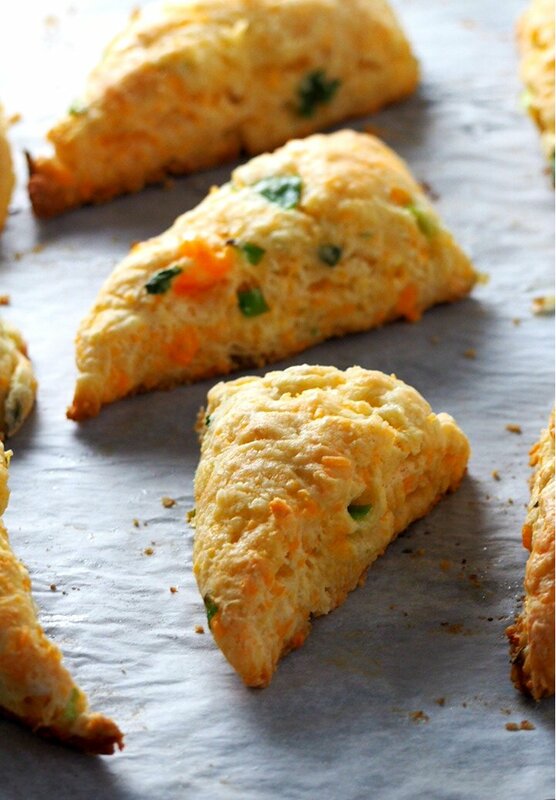 I love baking scones because they are pastry with less amount of work compared to making pies. It is this versatility that gets me hooked to baking. Actually, to bake and to write- these are the delicious ways I use my spare time in this busy phase of motherhood. Alongside raising my two girls, food blogging has me head over heels in love. Come September though, not the widest array of baked goodies can excite me. Not for the first few days, at least. My eldest turns grade one. This thought woke me up midnight today with a pang on my chest. She will be in school for 6 whole hours. Yet another transition for her. No. Yet another transition for me. I don’t think any amount of baking, no workloads of food blogging and no options of savory and sweet can make up for the short absence of my loud but sweet, shy but aggressive 6-year-old. Over-dramatic, yes. But it is these little transitions that get me each time. Those hours of having one less kid to insist on helping with my baking, of having one less kid beside me on my volunteer job. Those times when I’d be glancing on the book corner of the classroom where I work, and she is not there, immersed silently in a couch, with a book in hand. For the first few days of September, I don’t think I will be lifting a spatula, As I will be so immersed nursing the misery of having one less kitten by my side for 6 hours, each day. Sigh, sigh. Why are thoughts more dramatic and emotions more intense at midnight? I guess I should go back to bed and sleep these thoughts away. Or I could get up and bake. Make scones maybe? 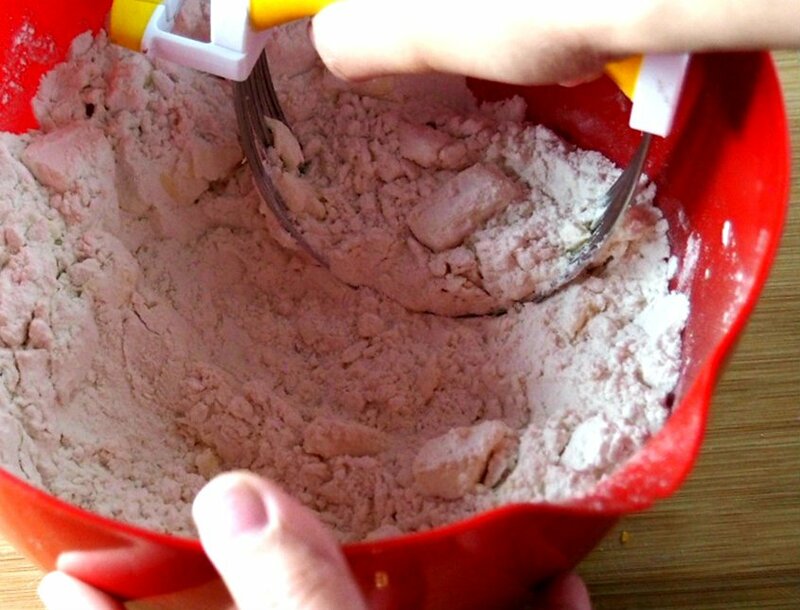 Whisk together flour, salt and baking powder in a large bowl. 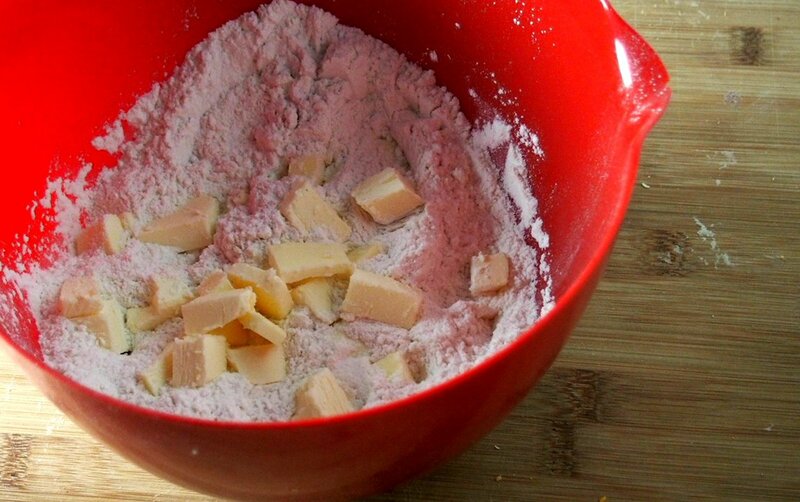 Add pieces of cold butter and cut them into the powders using a pastry cutter or rub then into the powders with your fingers. 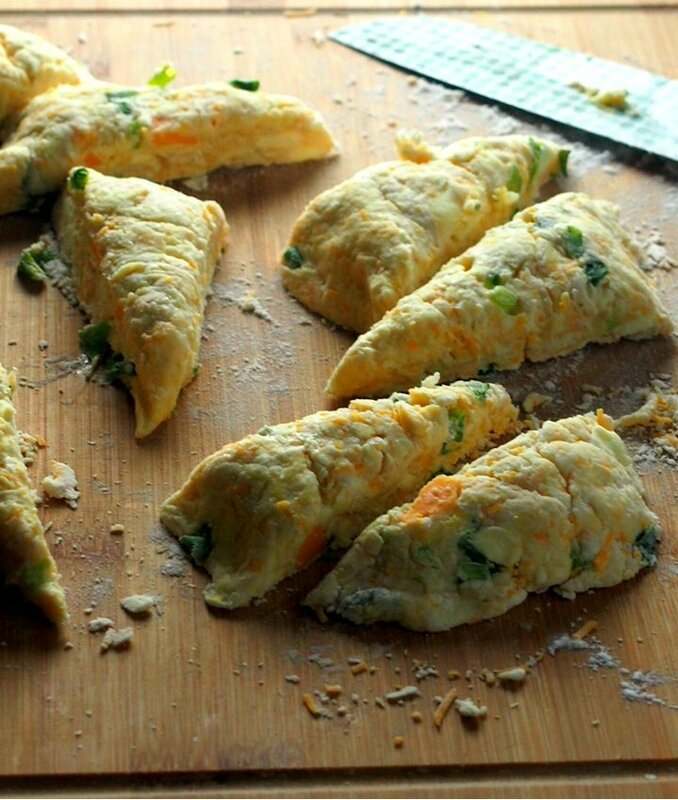 Once the mixture looks like a coarse meal with a few small and medium lumps all over, toss the cheddar cheese and scallions to the mixture. Combine sour cream and eggs and add them to the bowl. 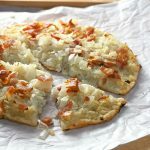 Mix until the ingredients are moistened and a soft, shaggy dough is formed. 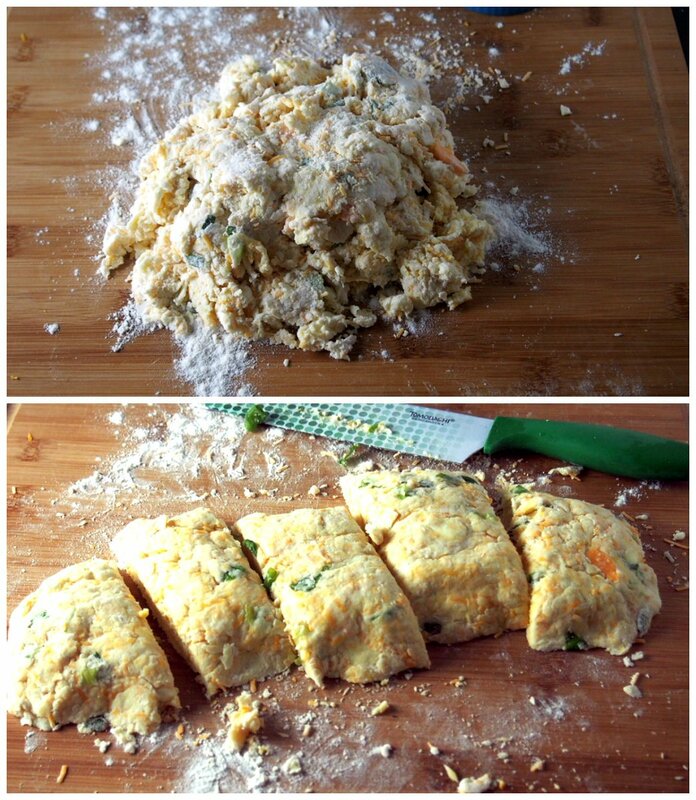 Turn the dough over into a floured board and pat it into a rectangle that is 10×2 inches. Divide the rectangle into 5 section to form 5 small rectangles. Slice each rectangle diagonally in half to form a total of ten triangles. 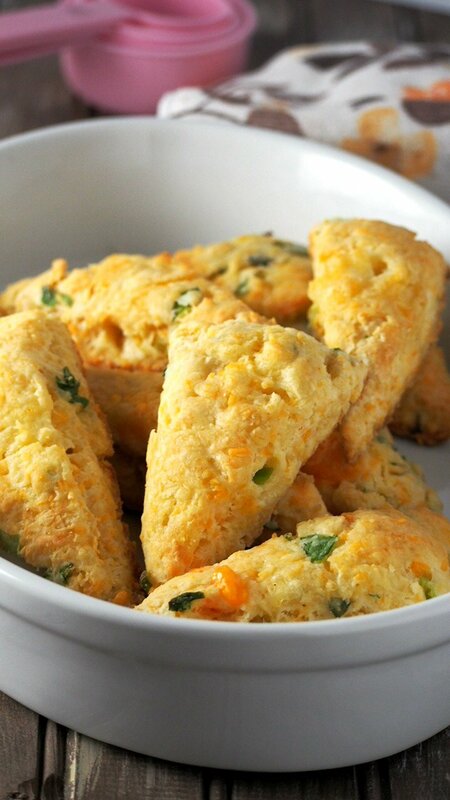 Place each scone in a baking tray that is lined with parchment paper, leaving an inch of space in between. Bake at 375 F for 16-20 minutes or until lightly golden. I think that is how baking and motherhood differs. With baking, you always have a choice. With motherhood, not as always. On such transitions, your choice will be to let go each time. Let them grow, let them soar. Let them be Grade One. Would you like to have a scone with me? Maybe all I need is a good talk over scones and tea. Preheat oven to 375 F and line a baking sheet with parchment paper. 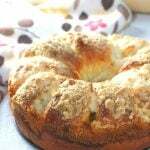 In a mixing bowl, whisk together flour, salt and baking powder. Add the pieces of cold butter and cut them into the powders using a pastry cutter or rub them into the flour mixture using your fingers. The mixture should turn into a coarse meal with small and medium lumps. 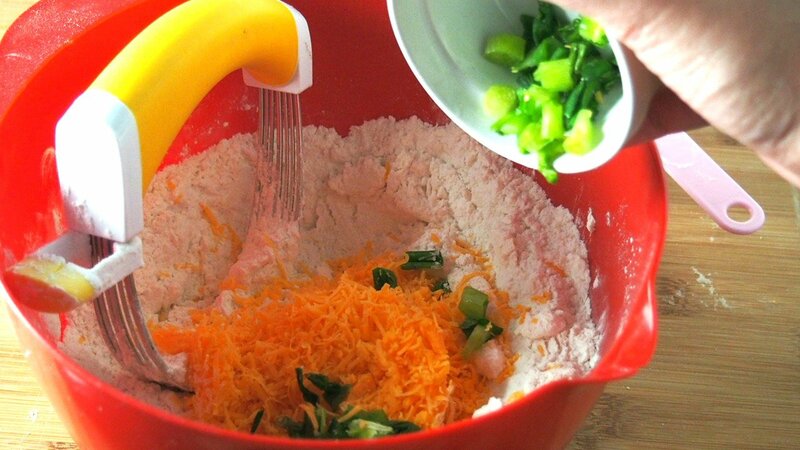 Mix in the cheese and the scallions to the bowl. Combine the sour cream and eggs. Add them to the bowl and stir everything using a wooden spoon just until the mixture is moistened and a sticky, shaggy dough is formed. 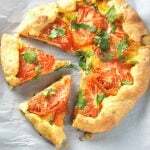 Turn over the dough in a floured surface. Gather and pat the dough into a rectangle that is 10x2 inches in size. Divide the rectangle into 5 sections to form 5 smaller rectangles, then divide each rectangle in half diagonally to yield a total of 10 triangles. Place them on the baking sheet with about an inch of space in between. 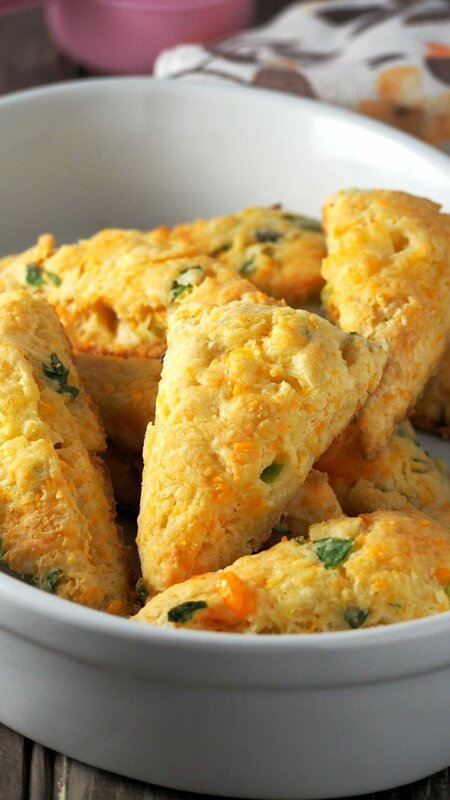 Bake at 375 for 16-20 minutes, or until the scones are lightly golden. 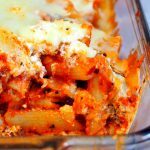 Store leftovers in a tightly covered container at room temperature.